Hair removal is one of the top five most popular non-invasive procedures performed in the 21st century. The eLaser from Syneron features the powerful combination of radiofrequency (RF) and high-power laser energies. 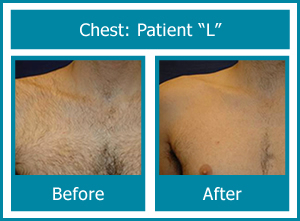 The result is efficiency, including the fastest hair removal available today. What is the advantage of eLaser over other laser hair removal systems? 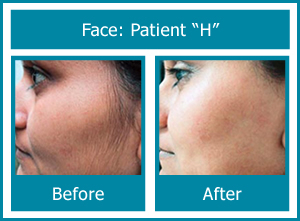 The eLaser can treat large zones very fast, and there are fewer clients excluded based on skin type or hair color. It has two energy sources which selectively target the hair follicle while minimizing unwanted side effects, such as superficial burns to the skin. Other lasers indirectly heat the hair shaft by superheating the melanin, hoping for collateral damage. What are most common areas of hair removal? Laser hair removal is most commonly used to remove unwanted hair on the upper lip, chin, neck, breasts, stomach, arms, shoulders, bikini area, legs and back. What are the usual results? The total number of visits varies from person to person and upon the area being treated. Most people achieve satisfactory clearance after 5 or 6 treatments but individual results depend on medical and genetic factors. Lighter and finer hair may require more visits than darker and coarser hair. There are more hair follicles in facial hair, often requiring 7-8 treatments. The laser target is hair in the active phase of growth only, so visits should be made every 4-6 weeks for most areas. Patients tell us the sensation is like a “snapping” feeling. You may also feel warmth or a tingling sensation for a short time afterward. An external cooling device is used to minimize discomfort. After treatment, can I tan? Patients should avoid tanning the area 2 weeks before treatment and a few days following the treatment. Deeply tanned skin should be treated 4-6 weeks after sun exposure. Currently there is no hair removal method that can provide permanent hair removal. After several laser hair removal treatments, you should experience a substantial reduction in the amount of hair and when the hair does grow back it will often be finer and lighter.